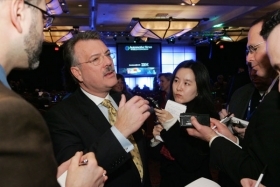 Dura CEO Tim Leuliette spoke with reporters Tuesday at the Automotive News World Congress. DETROIT -- Supplier Dura Automotive Systems Inc., which emerged from Chapter 11 reorganization last summer, is taking the first step toward becoming a private company, according to regulatory documents filed late Wednesday. The suburban Detroit company asked its small pool of shareholders for permission to stop filing financial reports with the U.S. Securities and Exchange Commission. The move came just a week after CEO Tim Leuliette, adding board chairman to his title, announced the companys determination to become more efficient and agile. Being public is a large expense and management time distraction, Sean McGuire, Dura vice president of global marketing, said in an e-mail to Crains Detroit Business, an affiliate of Automotive News. Dura said in the filing that its board of directors believes it is in the companys best interest to stop reporting regularly to the SEC. According to the filing, Dura had 48 holders of its common stock as of Jan. 1 and it is eligible to cancel its common stock because it has fewer than 300 holders. It was unclear whether Dura plans to buy out those remaining shareholders. Dura emerged from 20 months of Chapter 11 proceedings on June 27, 2008. The company registered its stock following its emergence, but it is not actively traded. The company has filed financial statements, but they have not been on time. In a statement last June, Dura said it expected to file its first on-time quarterly report with the SEC for the second quarter 2009. Leuliette added the chairman title on Jan. 13. Leuliette, the former CEO of Metaldyne Corp. and one of the supply chains most visible executives, took over for Duras departing CEO Larry Denton on July 13, 2008. Consolidating the responsibilities of chairman and CEO under one individual facilitates more efficient decision making and improved agility, both essential attributes during periods of economic volatility, Leuliette said in a statement released announcing his appointment. Dura said in the filing that it wants to receive all votes on the request by Feb. 20. Dura is a supplier of shifter systems, cable systems, seating control systems, engineered assemblies, structural and safety systems, modular glass systems and exterior trim. It ranks No. 88 on the Automotive News list of the top 100 global suppliers with worldwide sales to automakers of $1.89 billion in its 2007 fiscal year.